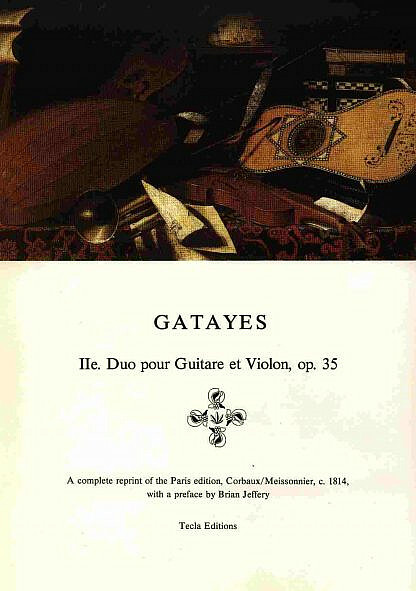 Gatayes’ Duo, op. 35 for violin and guitar comes from early 19th century France, an easy chamber work with guitar. This is an ideal piece for easy performance. Reprint of the first edition of Paris, c. 1814. Parts only, no score. with a preface by Brian Jeffery. First published by Tecla in 1985. Gatayes (1774-1846) wrote much music for the guitar, including with other instruments. He lived in the same apartment building in Paris as Marat, used to play the guitar to him, and was there when he was assassinated by Charlotte Corday.